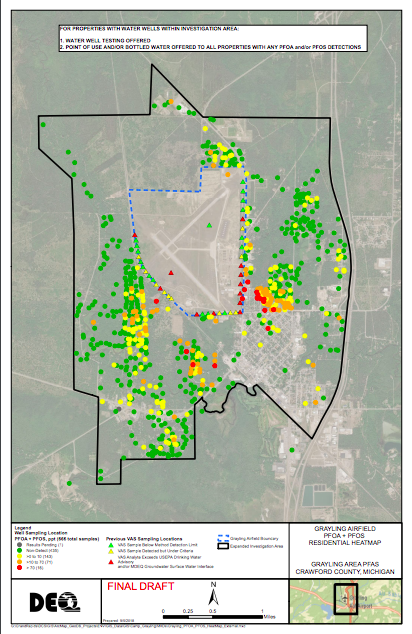 The red dots indicate where the PFAs level exceeds the USEPA drinking water advisory at Camp Grayling. State officials will begin using drones to find water contamination. The Michigan Department of Environmental Quality will use drones to look for PFAS in Lake Margrethe near Grayling this week. Elevated levels of PFAS were found at Camp Grayling on Lake Margrethe in 2017. PFAS compounds come from fire fighting foam among other things. They can cause cancer and reproductive problems. The drones will use infrared and regular cameras to identify springs, picking up where the cooler water from the springs enters the warmer lake water. Then state workers will test those springs for PFAS to see where the contamination is coming from. The DEQ says this is the first time they’ve used drones to do this work. State officials are currently testing municipal water throughout the state for PFAS contamination.